As part of our ongoing commitment to innovation, we’re delighted to be working with the University of Leeds on a new online course highlighting world class innovation. 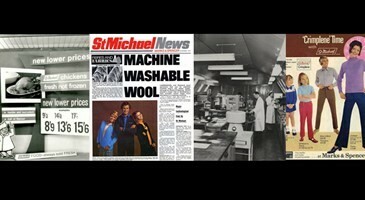 Using material from our archive, we share important developments in the fresh food supply chain and machine washable fabrics to highlight the importance of innovation and people to business success. Innovation: the key to business success runs from 15 September and uses cutting-edge case studies from the University of Leeds as well as M&S to show how people are key to driving successful innovation in existing businesses. Design expert Dan Trowsdale, who is a Senior Teaching Fellow in the School of Mechanical Engineering at Leeds, is heading up the three-week Innovation course. It aims to provide valuable professional development to people at various stages of their career. He said: “This course is about the innovation process, not just the idea of invention, but taking a creative idea, commercialising it and also how simple ideas can have a huge impact on society. innovations that move businesses forward. Alison Houston, Head of the M&S Company Archive, said: “This unique course brings together learnings from professional business and academia, illustrating how creative concepts are balanced with commercial thinking to forge business success. The course will run through FutureLearn, the social learning platform, and is open to anyone with a computer, tablet or smartphone. The courses feature videos, interactive quizzes and discussion forums which allow participants to ask questions and interact with their peers. Sign-up here to learn more.